New Delhi, March 21: Former Indian Cricketer Gautam Gambhir on Friday joined Bharatiya Janata Party (BJP) in New Delhi. 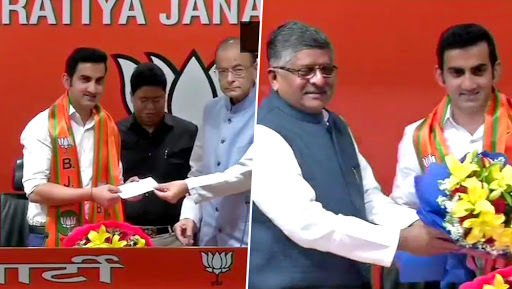 The 37-year-old cricketer joined the saffron party in the presence of union ministers Arun Jaitley and Ravi Shankar Prasad. It is reported that Gambhir will contest from New Delhi constituency which is currently held by Meenakshi Lekhi of BJP. Notably, Gambhir lives within the constituency in Rajinder Nagar. Sehwag Declined BJP's Offer to Contest Polls Citing Personal Reasons: Delhi BJP Leader. Speaking at the event, Gambhir said that he joined the ruling party after being inspired by Prime Minister Narendra Modi. "I am joining this party(BJP) after getting influenced by PM Narendra Modi's vision. I am honoured to get the opportunity to join this platform," he said. After joining Bharatiya Janata Party, Gambhir also met party President Amit Shah. Gambhir, who was recently conferred with India’s fourth highest civilian honour, Padma Shri, had earlier remained non-decisive whenever asked about joining politics. Earlier, this year, the former Indian opener received a congratulatory letter from Prime Minister Narendra Modi. With over nine million followers on social media, Gambhir has often raised his voice on social and political issues. Recently after February 14, Pulwama terror attack, which killed 60 Central Reserve Police Force jawans in Jammu and Kashmir, Gambhir pledged to provide educational assistance to children of martyrs.